The Mountain Village Workshop was held on May 30-31 in Shimizu, Minamiuonuma, Niigata. 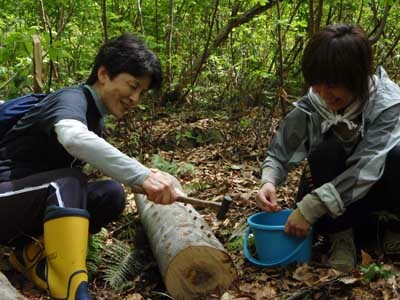 Participants planted about 25,000 nameko mushrooms in forest in the foot of Makihata mountain. The Mountain Village Workshop, following those in last year, was held on May 30-31 in Shimizu, Minamiuonuma, Niigata. Fourteen people participated, who were from an elementary school kid to middle-aged people in their sixties from Tokyo area. They worked on nameko mushroom project together with Shimizu Village people, which is a vitalizing project for depopulating Shimizu. 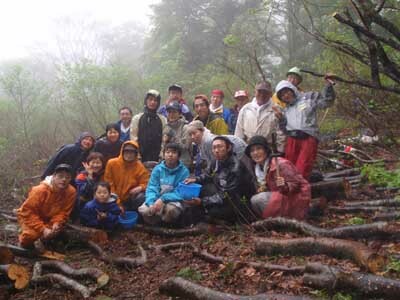 In the first day afternoon and the second day morning, participants planted nameko mushroom in forest in the foot of Makihata mountain. To reach the site, they had to walk narrow trail in the mountain and cross streams. Village people made holes on timbers and participants put nameko into these holes. They succeeded to plant about 25,000 nameko after five and a half hours work in two-day session. In the afternoon of 2nd day, village people and participants discussed measures of vitalization of Shimizu and nameko production. Participants commented, \”I will try to create a new menu for nameko dishes.\” \”Such food is valuable as we are able to know who produces and where and how. \” \”Not only the nature, but also people in the village are attractive.\” \”I got refreshed enough to get back to my work from Monday.\” Both village people and participants enjoyed this activity. This workshop was hosted by Shimizu district and organized by ECOPLUS.